TRIUMPH has unveiled this limited edition Rocket X to celebrate the Rocket III’s 10-year reign as the world’s largest-capacity mass production motorcycle. Limited to 500 units, the 2294cc Rocket X is finished in a ‘high-gloss custom paint scheme with “grind” effect stripes’ and has individually numbered side panels and a billeted aluminium name badge. Components including the exhaust, handlebars and mirrors have been painted black, along with black wheels with a hand-painted silver pinstripe. The Rocket X will cost £14,799 and is expected to be available from Spring 2015. Launched in 2004, and continually developed since, the Rocket III has gained iconic status as the bike that every rider has on their wish list of ‘must do’ rides. And now, born from the biggest, baddest and meanest bike out there, the Limited Edition Rocket X offers the ultimate ride and status. It’s not a cliché, it’s a truism: Triumph’s Rocket X is a unique motorcycle with the most unmistakable presence on two wheels. There is nothing else like it on the road, and no other motorcycling experience even gets close to the sense of the awesome potency of a Rocket III Roadster making progress. With its 2,294cc three cylinder engine sitting in line with the chassis, the Rocket X is home to the world’s largest production motorcycle engine. Delivering a 221Nm sledgehammer of torque at just 2750rpm, the Rocket X delivers extraordinary acceleration in any gear at any revs. For the Rocket X, Triumph went to premium custom paint specialists 8 Ball to create a scheme that truly sets this bike apart and that would make every one of the 500 Limited Edition bikes unique. The quality, craftsmanship, and attention to detail required to achieve the desired effect is at the very top end of the custom paint scene. The sheer depth of the gloss Jet Black paint contrasting with the ‘grinded’ polished metal stripe, Triumph logo, and Rocket X emblems offer an incredible quality and sense of solidity that’s truly befits this iconic machine. Firstly the tank and mudguards are stripped completely back and then undergo a ‘grind’ effect that provides unique shapes into the bare metal. The tank stripes and logo are carefully lined, and then follows the painting process when craftsmen apply a Jet Black base layer, followed by a clear coat layer. After leaving 2 days for the paint to rest and cure, a total of 6 layers of lacquer are applied using ultra high solid paint. The paintwork is then highly polished and again left for 2 days to cure. Second polishing is then applied to provide an incredible smooth finish with amazing depth. The result is something truly stunning. Vying for attention with the custom paint and 2.3 litre engine is the black exhaust system. 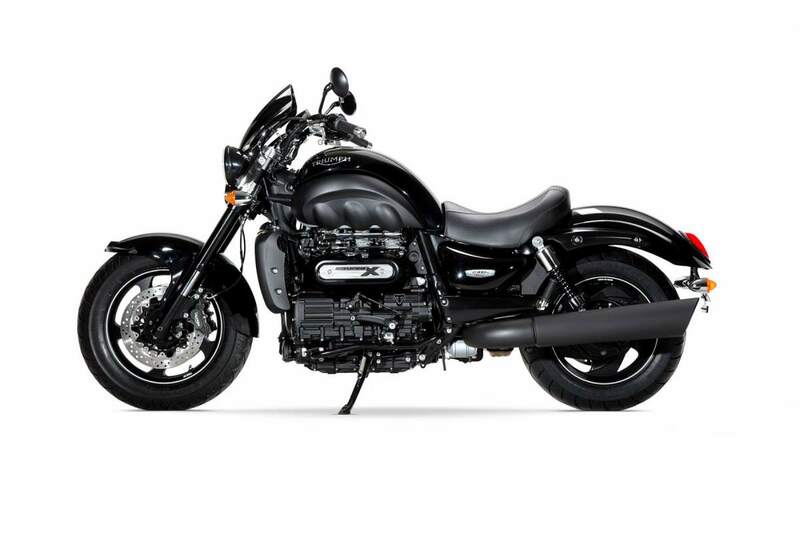 The twin-skinned full exhaust system is coated with high temperature resistance paint, rated to maintain Triumph’s signature quality finish and the Rocket X’s world turning torque figures. A black fly screen shrouds the chrome ringed instruments to add even more visual presence. The mean look has also been further enhanced with the addition of black finishing to the handlebars, mirrors, gear, and brake levers. The Rocket’s signature 5-spoke aluminium alloy wheels have also received the black treatment and are skilfully finished off with a complimenting hand painted pinstripe. Every one of the limited run of 500 motorcycles will feature side panel badging and unique numbering. For an even greater sense of solidity, the oil tank mounted special Rocket X badge is machined from a billet of solid aluminium using a CNC milling machine adding an exquisite premium finish. With its free-revving engine and crisp fuel injection, the Rocket X responds quickly, cleanly and strongly at any speed and in all gears. The 12-valve motor features a bore and stroke of 101.6 x 94.3 mm, with twin butterfly valves on the throttle bodies and sensors for throttle position, engine speed, engine position, engine temperature, air temperature, air pressure, gear selected and road speed, which combine with the sophisticated ECU to determine the correct fuelling and ignition to tailor the torque curve for each gear ratio. The engine itself is solidly mounted in the frame and used as a stressed member, as this gives the stiffest connection between the headstock and swingarm pivot, while the fully balanced three-cylinder layout ensures that vibration is minimal. The forged 17kg (39lb) crankshaft runs in four bearings with the individual crank pins set at 120°, firing the three pairs of sparkplugs in cylinder order from front to rear. The balance, input and rear drive shaft contra-rotate against the crankshaft, which makes for minimal torque reaction, though the mass of the big engine spinning up can still be felt at standstill – a measurable part of the Rocket III’s appeal. The Rocket X transcends genres. With its mid-mounted pegs and relatively upright riding position, the Roadster takes on a muscular stance and delivers an attitude-laden ride that every motorcyclist should experience at least once in their two-wheeled career. The ergonomics ensure that the Rocket X is surprisingly easy to hustle through corners, and with a plush seat for both rider and pillion, and comfortable and controllable rear suspension, it’s more than capable of covering long distances with aplomb. Up front, the Rocket X sports Triumph’s trademark twin headlights to make this imposing motorcycle even more striking, while the components carefully balance black and chrome to create an aggressive stripped down look. To cater for the Rocket III owner’s desire to personalise their bikes a wide range of Triumph Genuine Accessories is available. As with all new Triumph motorcycles, the Rocket III Roadster comes with an unlimited mileage, two year factory warranty.